Loaded with shrimp, this Chilled Italian Shrimp Tortellini Pasta Salad is perfect for dining al fresco! 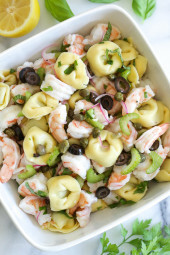 This delicious, light shrimp and tortellini salad can be served as a side or main dish, perfect for summer potlucks or pool parties, or anytime you need a pasta salad that isn’t weighed down with heavy mayo. Great to make ahead as the flavors get better the longer it sits. Leftovers are perfect to pack for lunch! Other salads you may enjoy are Shrimp Ceviche and Avocado Salad, Italian Antipasto Salad, and Penne Arugula Salad with Sun-Dried Tomatoes. Delallo asked me to create a recipe using their Ricotta and Spinach Tortellini and tortellini salad was the first thing that came to mind! I LOVE a good tortellini salad in the summer, but often it’s made with lots of olive oil, cheese and salami or ham which makes it a pretty high calorie dish. I wanted to make a lighter version and loved the results. Loaded with shrimp, a low calorie protein and lots of fresh celery, olives and lemon juice, this salad is a winner! As a main dish, the portions are generous, if you want to serve this as a side I would serve half the portions. You can also make half the recipe if you want to make this for less people. 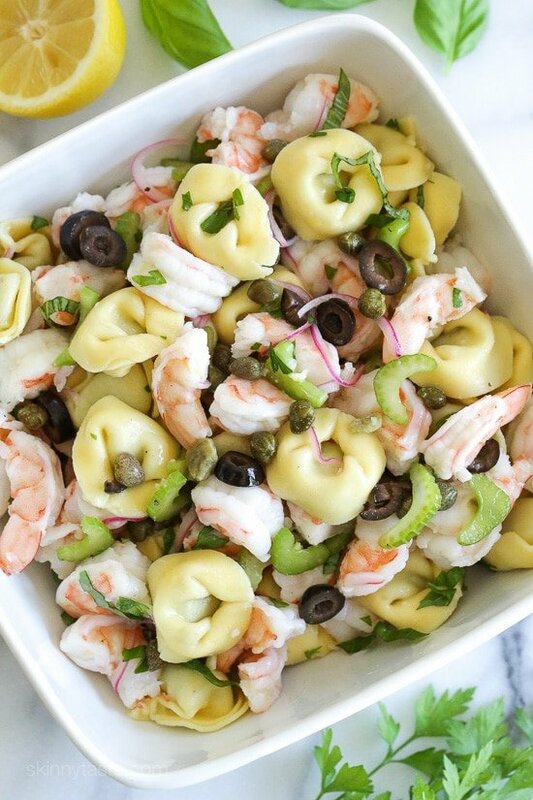 This delicious, light shrimp and tortellini salad can be served as a side or main dish, perfect for summer potlucks or pool parties, or anytime you need a pasta salad that isn’t weighed down with heavy mayo. In a large pot of salted boiling water, cook tortellini according to package directions. Using a large mesh spoon, transfer the pasta to a colander and rinse under cold water. Return water to a boil and add the shrimp, poach for 2 to 3 minutes, until they are just pink, rinse under cold water to stop them from cooking, drain and cut into large pieces. In a large bowl, mix the onion, celery, capers and olives and pour the dressing over; mix well. Add the shrimp, tortellini and remaining ingredients. Adjust salt and pepper to taste and chill before serving. 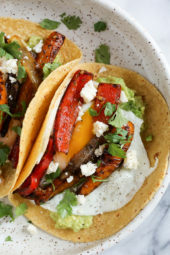 I created this recipe in partnership with Delallo Foods. I only work with brands I LOVE and use in my very own kitchen. Hope you enjoy the recipe! I’m eating this as I type and it is absolutely delicious. Very refreshing too ! Love it. I haven’t tried a Skinnytaste recipe yet that I didn’t like !!!!! The dressing was bitter. Very bitter. I checked each of my ingredients and they were fine individually. Unfortunately, I had already put the dressing on the whole thing before I tasted it. Lesson learned!I recommend trying a different dressing recipe. Did you use fresh lemon? It shouldn’t be bitter. Simple, light and delicious! I roasted the shrimp in the oven. I felt like it had some really good dimension! Thank you! Simple to make and looks impressive. Great for a summer gathering or potluck. You could also serve it as a light main meal. I couldn’t find spinach tortellini so I use three cheese. It really makes a lot. I cut it in half because there is only the two of us, but I used the full amount of dressing. I will make again. great, one of my favorites! We made crab legs for Father’s Day dinner. I used the left over crab in place of the shrimp. It was a winner, just like all of your other recipes! Thanks Gina! I didn’t think I would like this recipe because of all of the conflicting flavors and textures. I happened to have all of the ingredients and I needed to get rid of package of tortellini. I was surprised that I love this salad and today is my second time making it. I guess it doesn’t hurt to try new things once in a while. This is an amazing pasta dish for the summer! It’s light and flavorful And very easy to make! We omitted the olives because we’re not big fans of them, but it still came out perfectly! I will make this over and over again! Loved the lightness and refreshing taste of this dish.As you noted, it was even better when having the next day. I will definitely make this again. Thanks Gina for this yummy recipe. Because there are only 2 eating at my household, I had this 3 times. I try to space my leftovers out and by the 3rd meal it seemed a little dry. So, I warmed it up quickly in the microwave! Moisture came alive again and it was delicious! I’m highly allergic to gluten, I’m assuming that this yummy recipe can have gluten free pasta subbing for the tortellini?????? I just tried this recipe last weekend. I loved it – so many ways you can go with it but I followed the recipe except for sautéing the shrimp with a bit of seasoning instead of boiling it and just covered it with foil until I finished the salad and we ate it warm instead of chilled. It was wonderful thank you so much and as you say perfect for bringing to a summer affair – love your recipes thanks again! Could fully cooked Jumbo Shrimp be used here? Just made this, it’s delicious! Do you use a specific brand of shrimp? It always looks so good!! I didnt have shrimp and substitued carb meat and it was really good. I love this recipe. For some modifications: I used Bertolli pastas. I also subbed fully cooked chicken breast slices in for some of the shrimp (for my boyfriend). Turned out equally as yummy. Also, for an optional garnish, I added crumbled chèvre cheese (aka goat cheese: classic or herbed). Wouldn’t recommend that for those looking to steer away from cheese. But for the cheese lovers, it’s awesome. Could you carmelize the onions? If you like. I haven’t tried it, let me know if you do! What would be a good substitute for the celery? White wine vinegar, rice wine, apple cider or balsamic would be acceptable subs. I made this for dinner tonight, it was a hit all around! I have some leftovers, i can’t wait to try it tomorrow for lunch after it marinated over night! I increased the parsley because we all love it here and i was out of capers but i threw in some marinated artichoke instead. I will make it again for sure! Made this last night for my boyfriend and I, and it’s already gone today! So delicious we could not stop eating it! Followed the recipe exactly and it turned out great! Will be making again! I’m eating this right now and love it! Great combination of flavors with the fresh herbs and the briny olives and capers. 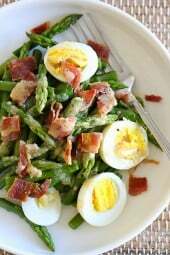 Makes a great lunch over romaine for some extra crunch and bulk. This recipe sounds great for a hot weather dinner. I’m going to try it with imitation crab meat. Can’t run to the grocery store today for shrimp. I think it would taste pretty good with crab meat. Thanks for the recipe idea. hi Gina! this recipe was absolutely delicious! I have plenty leftover. how long do you think this would keep in the fridge? thanks in advance! Made this for dinner tonight – what an awesome recipe!! Will definitely make again! I prepared this dish as an entree for tonight, and it was chilled and waiting when I arrived home from a class @ 5 p.m. And no hot kitchen (heavenly on a late August day in Alabama)! I used only one pound of shrimp, which was plenty. And I substituted yellow and green bell pepper and a small diced cucumber for the celery. A couple of wheat rolls completed a delicious meal — this recipe is a keeper! Made this tonight and it was a huge hit! I had eight adults and my picky picky four year old and all gave it two thumbs up. I used precooked shrimp I defrosted because they were on sale. Served it with a grilled flank steak (so kind of a surf and turf). Loved the video too, it really enticed me to give this a shot. Awesome! So glad you enjoyed it! Love the surf and turf! What’s a good substitute for the olives? Roasted red pepper or fresh chopped tomato would be good. If your local grocery store doesn’t carry it you can shop for it online. What other type of tortellini can you use. Cannot eat spinach due to blood clotting factor? You can use Delallo’s three cheese tortellini. Looks fabulous. Making this tonight! But are you sure it’s 2 pounds of jumbo shrimp plus all that pasta for 6 people? What if you don’t eat shrimp? THEN DON’T MAKE THIS SALAD ? I think adding garbanzo beans (or any type) would be delish! I enjoy shrimp, but I think this would be great without. Maybe even grilled chicken that was chilled. Play around with it. I am going to use my olive garden light Italian dressing with it. LOL! Great comment. I don’t mean to laugh but it’s funny what people say about recipes. “It didn’t turn out! But I used all different ingredients!” Have to see the humor in life!? We have shellfish allergies in our home. I cut up chicken and marinated in low fat Italian dressing and sautéed in a pan, then substituted for the shrimp. Everyone loved it. Hope that helps. I’m allergic to shrimp, but I liked the idea of this salad, so I used packaged grilled chicken and it was yummy. April, there is meat tortellini in supermarkets but it may not go well with shrimp and will also affect the smart points value.. Maybe just go with regular pasta, maybe orrechiette? There are small and firm like tortellini. Sara, look for Seviroli brand. They are decent and are in the frozen section. There is also one called Italian Village- they are o.k. but not too cheesy. This is a lot of pasta! How long do you think it would keep in the fridge? Thanks… Love your recipes! Really into this recipe, Gina! Although Delallo is a wonderful brand, they do not sell their products anywhere near me :(. Any recommendations for a tortellini I could find at a basic grocery store? I used Three Bridges Spinach and Cheese Ravioli because that was what I found that seemed close to what Gina was calling for. I really liked it AND when I put the recipe in WW recipe builder, it only came out to 7 Smart Points instead of 8! Don’t really know if that was because of the brand of pasta or not. I don’t like cheese, but would love to try this! Any tortellini without cheese? Thanks! !